The League of Assassins have framed The Arrow for the murder of Mayor Castle and Quentin Lance is out for blood! As Ray Palmer (who was also wounded in the attack) languishes in critical condition and Felicity debates defying a doctor's orders to use untested technology to save his life, a revived SCPD Anti-Vigilante Squad hits the streets with one goal - bring in Team Arrow, dead or alive! But this is only Ra's Al Ghul's first attack on Oliver Queen. And by the time he is done things will never be the same! The Black Arrow Saga by Mike Grell and The Fall of Green Arrow by J.T. Krul (both stories in which Oliver Queen becomes an outlaw and his secret identity is revealed to the world), The Over The Edge episode of Batman: The Animated Series (both stories deal with a grief-stricken police officer turning on his vigilante comrades after said vigilantes cause the death of the police officer's daughter) and every Robin Hood legend where Robin sacrifices himself to save his friends. I can see why - in spite of everything - Lance might not arrest Laurel for what she's done as Black Canary. But why doesn't he go after Roy or Felicity? He knows both of them work for The Arrow. And granting that Roy's house in The Glades might not be in his name, Lance knows where Felicity works and could probably find out where she lives. Hell, Felicity doesn't make any effort to stay hidden, staying at the hospital with Ray Palmer, even though we're told that warrants have been issued for all of The Arrow's known associates. Even by the standards of comic books, Shado having an identical twin sister whom Ollie just happens to run into in his time of need is a hell of a coincidence. 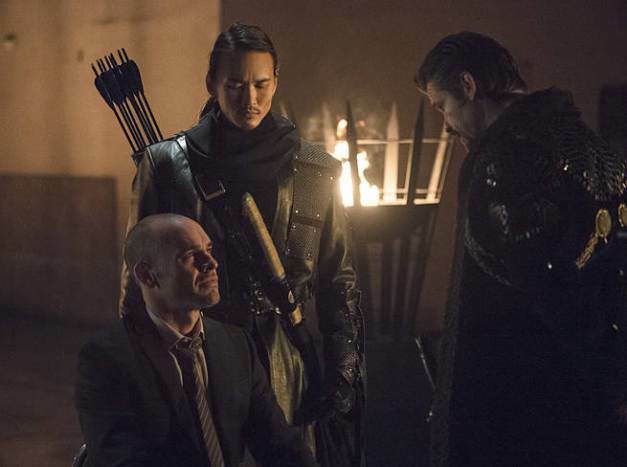 Paul Blackthorne has a difficult task in this episode. On the one hand, he is the Javert to Oliver Queen's Valjean, and we are meant to see him as the villain who is letting his personal feelings get in the way of his judgement. On the other hand, his conflicted emotions regarding every situation in his life right now are completely justified and he isn't totally wrong when he asks if people might not have been better off if Oliver Queen had died on Lian Yu seven years earlier. Charlotte Ross returns as Felicity's mom and while her main role here is to lighten up what could be some otherwise dark moments, she also proves capable of offering some surprisingly wise words regarding the one thing Felicity has never been particularly smart about - her emotions. Colton Haynes doesn't get much to do as Roy Harper in this episode. But he makes every moment count as we see just how much Roy has gained in his rebuilt relationship with Thea, how much he has lost in his guilt over what his heroism has cost others and how far he is willing to go to save his mentor. The extended action sequence taking up the second sixth of the show - with Team Arrow trying to escape the entire SCPD - ranks among the show's best. In the comics, Ray Palmer is frequently called in as a nanotech specialist to assist with difficult surgeries. Of course in the comics he usually assists by shrinking to go inside the patient rather than by using nanites. This is not the first time Oliver Queen had his secret identity revealed to the world after being framed for a crime he didn't commit. In Mike Grell's The Black Arrow Saga, Oliver Queen is framed for espionage and high treason by covert elements of the U.S. Government and his secret identity is revealed as he is forced to go on the run to clear his name. In more recent times, in the post-Infinite Crisis DCU, Oliver's secret identity was revealed to the world in The Fall of Green Arrow. In this miniseries, Oliver killed the super-villain Prometheus and went on trial for murder. Oliver was honestly guilty of the crime, committed as revenge on the man responsible for killing his adopted granddaughter Lian Harper, but was acquitted on all charges despite the efforts of a corrupt police commissioner whom had long-standing grudges against both Oliver Queen and Green Arrow. This episode bears some resemblance to an episode of Batman: The Animated Series called Over The Edge. In that episode, an enraged Commissioner Gordon pursues a vendetta against Batman, after his daughter Barbara Gordon (aka Batgirl) is killed in action and he learns her secret identity. The action of the episode is later revealed to have been a Scarecrow-gas fueled nightmare that Batgirl had after nearly being killed. Oliver's sacrifice at the end mirrors several Robin Hood legends, where Robin Hood surrenders himself to his enemies in order to buy the freedom of his friends. Ray Palmer is diagnosed with a thrombus - i.e. a blood clot. If left untreated it could cause an ischemic stroke. But due to his injuries, a craniotomy could do more harm than good. Harm, in this case, meaning permanent brain damage. Ray developed a series of nano-tech robots that could be injected into his bloodstream, travel to the clot and shrink it. Laurel: You don't understand what's happening here and I need you to trust me. Ra's: (slow clap) Clearly I chose well, selecting you as my heir. Ra's: Killing me will only win you the mantle you reject. Arrow: It will stop you! Ra's: I have legions who live only to see my will done. No, boy. You have but two choices. You either ascend to the calling of Ra's Al Ghul. Or you will spend the rest of your days in a cage. Arrow: You're not going to take me prisoner! Quentin: I got three men in the hospital because of you. Arrow: I understand that you feel betrayed. But you can't be so angry as to think that I'm just running around taking aim at innocent people. Quentin: I don't think anything! I know! I know this madness has to end! And if you don't want any more people getting hurt, you turn yourself in. Ra's: I apologize for the coarse treatment. I didn't think I'd get you to speak to me of your own accord. Ra's: Ra's Al Ghul. It's an honor to meet you. Sara spoke with such love about her father. Quentin: Don't say my daughter's name! If she'd never met you, she'd still be alive now! Ra's: If Sara had not met my daughter, she would have starved to death on the shores of Lian Yu. Quentin: She was never on Lian Yu. Ra's: You suffer a false perception. One of many, I'm afraid. Quentin: Listen, what do you want? Ra's: To help the city as your daughter did. You hunt for the man they call The Arrow. Quentin: Yeah. What, you're gonna help me find him? Ra's: You'll be able to find him easily... once I tell you his name. Quentin: Now why would I believe just any name that you throw at me? Ra's: Well... because with this revelation everything will become clear. And you will realize the man you've been looking for has been right in front of you the entire time. The same man who lied, telling you he wasn't with Sara on Lian Yu. Oliver Queen is the Arrow. Laurel: So what? Now Oliver's to blame for Sara's death? Quentin: Oliver? The Arrow? Either way, it's the same guy. Quentin: On some level I think I always knew. When I thought he was doing good, it didn't matter to me. You know, when that boat went down and we thought Sara was dead? I blamed Queen. And it's funny how things come full circle, right? Thea: I can't believe this is happening. Roy: The line forms behind me. Thea: I'm sure those cops that were chasing you are fine. Roy: I shot them with arrows, Thea. When it was happening, there was a part of me that... felt relieved. Roy: That I'd finally be going to jail. And that I would get what I deserve. Thea; Roy, listen to me. The only thing you deserve is to be happy. Felicity: I'm just glad that you're alright. Felicity: Oh, I think your nano-tech deserves some of the credit. All I did was stick something in you. (pause) Do you think there will ever come a time when everything I say isn't some weird double entendre? Ray: I hope not. It's one of your more charming traits. Mei: You have no idea how powerful The Truth can be. Quentin: This, ah.. Ra's character. He told me that Sara made it to the island with you. You didn't feel like sharing that with me? Huh? I mean, I am only her father. Well, I was. (Pause) When did you decide that you knew what was best for my family? Quentin: (angrily) You have a right to remain silent! Take it. Oliver: ... just ask me what you want to know. Quentin: (scoffs) What do I want to know? Well, was it worth it? All that pain and misery you brought back from that island? Merlyn. Slade Wilson. Wouldn't it be better if you just died there? Quentin: I hate to break it to you, but saving people isn't your specialty. Tommy. Hinton. Your mother. My daughter. And now you're set on killing Laurel too. Oliver: (shaking his head) I didn't want her to be involved in this. I didn't want anyone to be involved in this. Quentin: But you involved me. You spent a year making me look like a fool. You spent a year making me your accomplice. You have any idea what you've done, huh? What you've done to all of us? To the people that you claim to care so much about? You've made us criminals. You've made us liars and victims! You, Mr. Queen, are not a hero. You're a villain! But you know that, don't you? Mei: Why are the police shooting?! Ollie: Because they're not the police! We see the assassination of Mayor Castle from 317 again as the episode opens, but this time we see Ray pushing Felicity to safety and taking the arrow that was meant for her in the chest. Captain Lance reinstates the Anti-Vigilante Task Force, which he closed down back in 301. Roy and Thea are officially a couple again. Thea suggests that she and Roy runaway somewhere together - like they originally planned in 223. Ray is treated for his injuries by Dr. Lockhart, who was previously seen in several other episodes including 301, 220, 219, 211, 204 and 117. Donna Smoak appears for the first time since 305. Roy refers to his feelings of guilt regarding killing a cop while on Mirakuru in 220. Ra's Al Ghul reveals Oliver's identity to Captain Lance. Lance, in turn, exposes Oliver's secret identity to the world. Lance makes reference to every vigilante who was inspired by The Arrow, including The Huntress, "the freak in Central City" (The Flash) and "a new guy flying around the city" (The Atom). Roy Palmer and Felicity Smoak are both fans of Doctor Who. Ray is said to know the plot of every episode across 34 seasons. Reference is made to how Oliver threw the SCPD off his trail back in 105. Roy refers to when Diggle last dressed up in The Arrow costume to impersonate Ollie, which first happened in 105 and happened more recently in 310. Felicity realizes she does not truly love Ray Palmer and still loves Oliver. Oliver turns himself in, in exchange for a promise of immunity from prosecution for Diggle, Roy and Felicity. The episode ends with Roy, in Oliver's costume, attacking the police convoy transporting Oliver and turning himself in, claiming he is the real Arrow. In the flashbacks, Oliver runs into Shado's twin sister Mei while fleeing Waller's men on the streets of Hong Kong. Oliver uses the name Tommy as an alias, in honor of his friend Tommy Merlyn. When asked about the last time he saw Shadow, Oliver has a flashback to her death in 209. Oliver does not give Mei the full details of how her sister and father died, but he does confirm their deaths. A thrilling episode which leaves you on the edge of your seat throughout.